AVES is a light card game features set collection and hand management. In this game, players become pure white birds, and by collecting the fruits of the rainbow tree, they gain beautiful colors on their feathers. Players have to manage their hand well and trade the fruits carefully to win the game. Only the basic subtraction concept is required, so children can also enjoy the game with ease. Adults can do more thinking, scheming, and risk-calculating, experiencing the game on a different level. In addition, there are two alternative modes, “Greedy Crows” and “Showdown!”, with more funs for advanced players to explore! Note: This item cannot be shipped to your country. Please contact your local boardgame shops for purchasing this item. Q. If the card I play matches the difference between 2 cards on the fruit circle (e.g. play #2 between #3 and #5), can I draw a card at the bottom of the deck instead of taking the 2 cards? A. If you place it between the 2 cards, you can only take back the 2 cards. However, you can place it between other cards of which the difference doesn’t match it (e.g. play #2 between #5 and #1), or play other card instead, to draw the card from the deck bottom. Q. What happens if the deck runs empty? A. When the deck runs empty, the game ends immediately; if you got more than 7 cards in your hand, please return 1 card back to the fruit circle. Now you may compare the who got more colors in their hands; if it’s a tie, compare the sum of the number of fruits you got. If the numbers of the fruits you got are still the same, you win together. Q. What if I got a crow in my hand in the situation above? A. 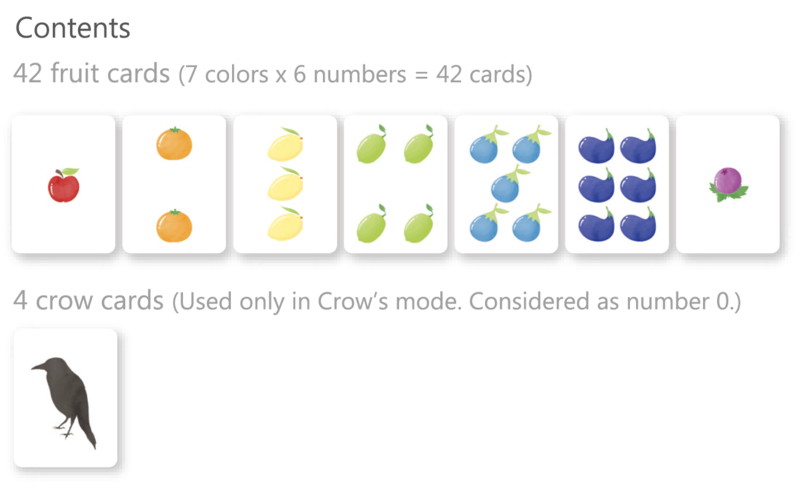 The crow doesn’t count as a color, so when you compare the colors you got, remember to exclude the crow.